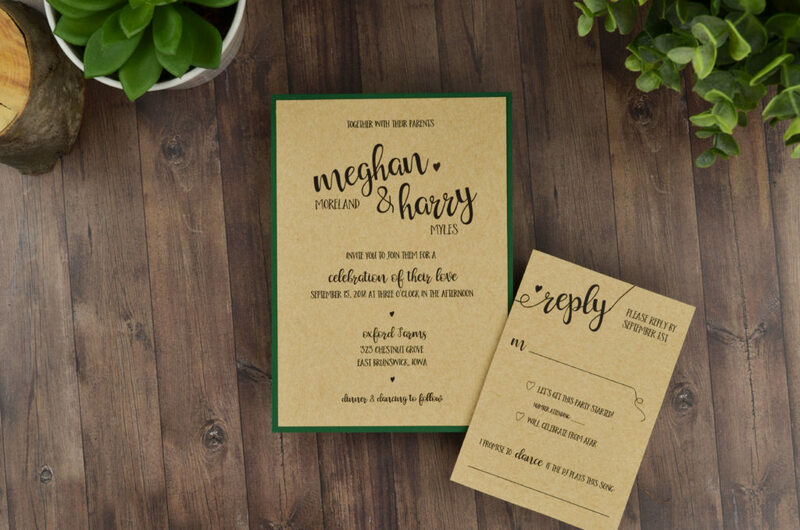 If you’re a simple and sweet couple but want to add an rustic finishing touch to your invitations, try adding a subtle wood grain vellum wrap using our semi-transparent Frozen Limba! 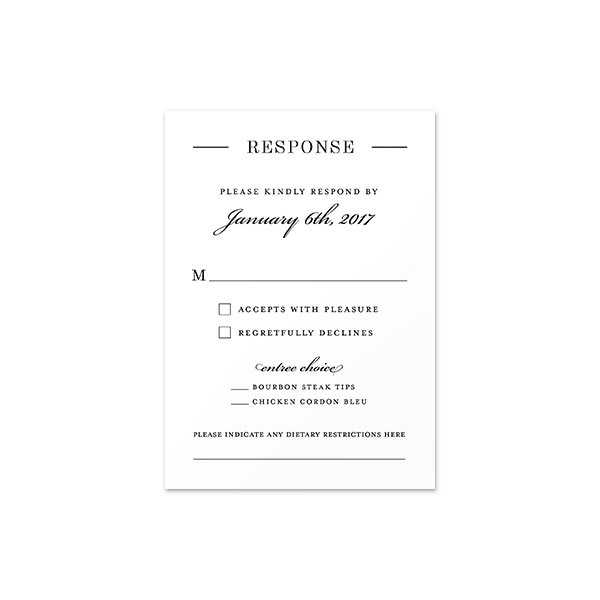 To assemble: Line up the your invitation card in the corner of an 8.5 x 11″ sheet of Frozen Limba. 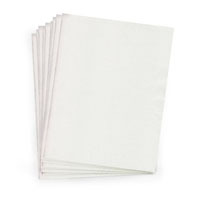 (The long side of your invitation should be lined up with the short edge of the vellum). 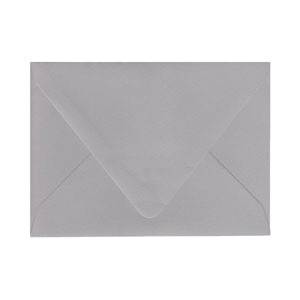 Mark the height of your invitation card on the frozen limba with a pencil and cut with scissors or a paper trimmer. 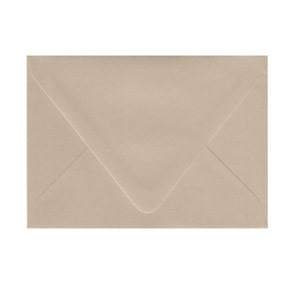 Line up and center your invitation card on the cut frozen limba (the frozen limba should be the same height as your invitation card), and fold both sides so that they overlap in the front middle. 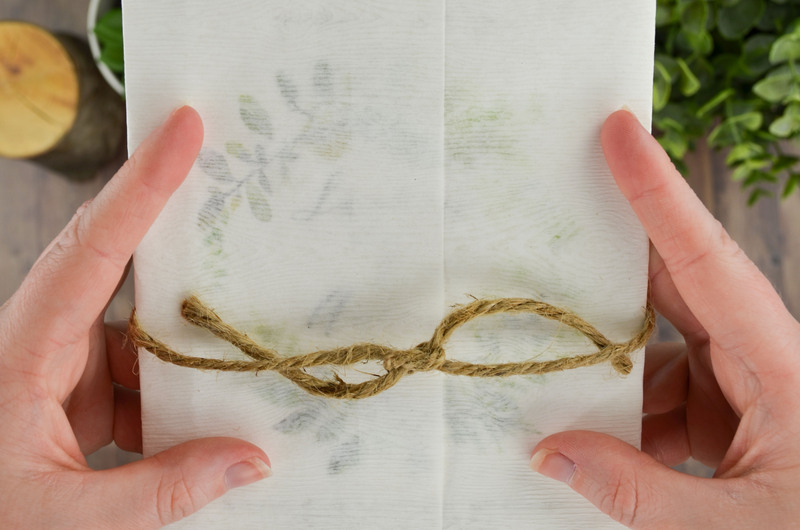 You can then tie twine around your wrap to keep it closed or use any other method you would like, such as a wax seal, bellyband, or ribbon. 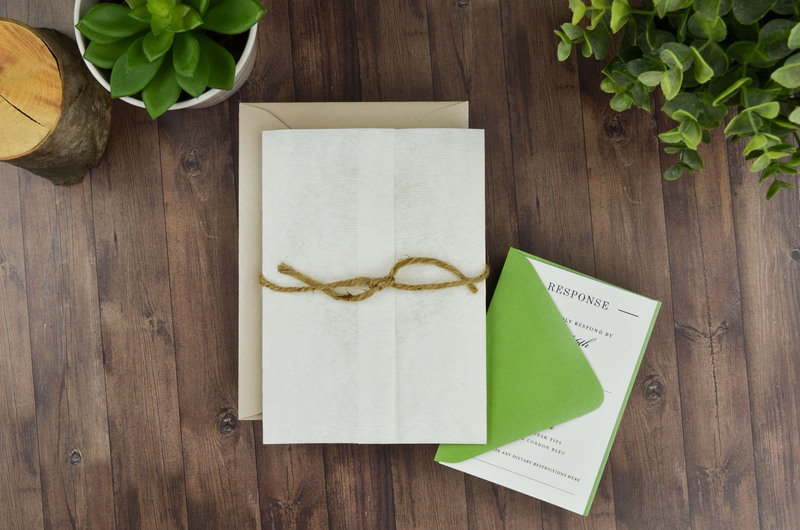 This look is especially pretty wrapped up with twine with the invitation design peeking through the frozen limba wrap. 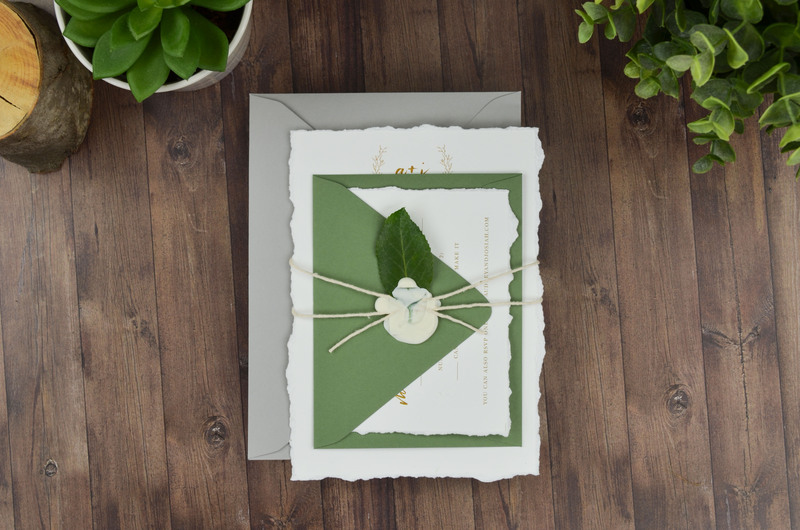 For a small and sophisticated embellishment, choose your greenery of choice, whether it’s a leaf, flower, or herb, and use a wax seal and string to wrap up your invitation suite as a lovely little finishing detail. 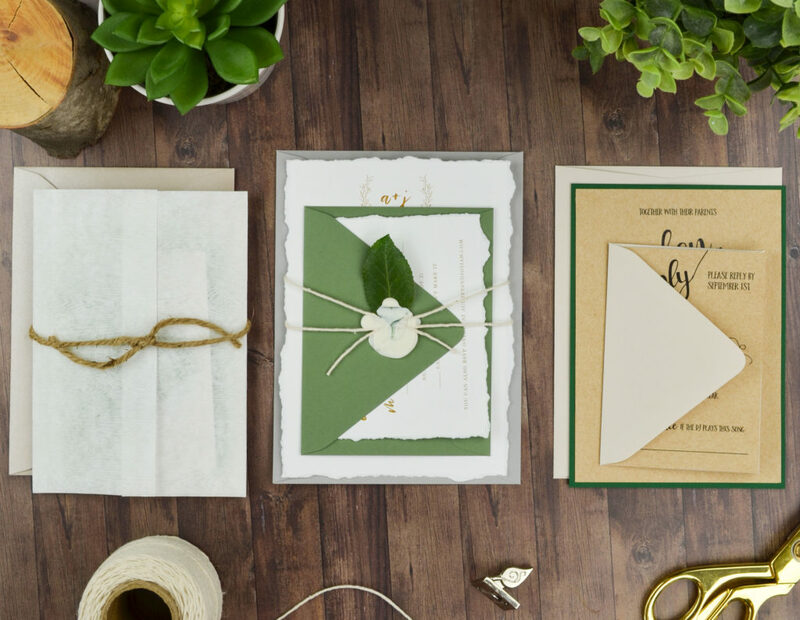 To assemble: Once you’ve hand torn your deckled edge invitations, lay your string on top of your invitation card so that it’s straight and centered and wrap it around your invitation crossing it in the front center. 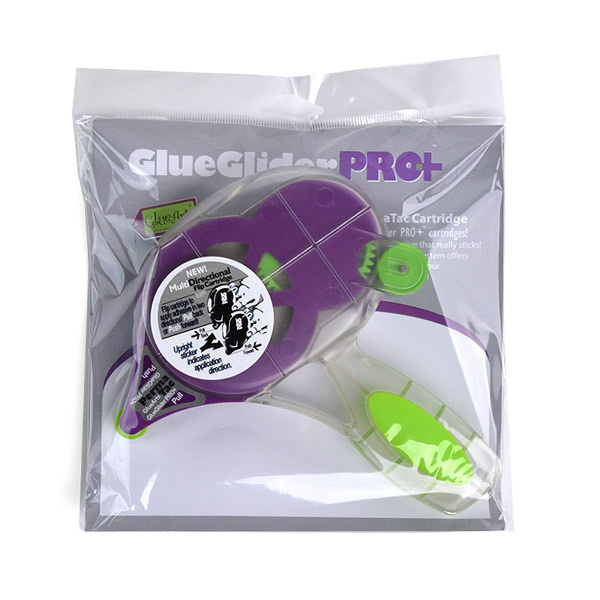 Hold your string in place as loose or tight as you want it, slide wax paper behind your string, and place your leaf (or other greenery of choice) on top of your string where it overlaps. 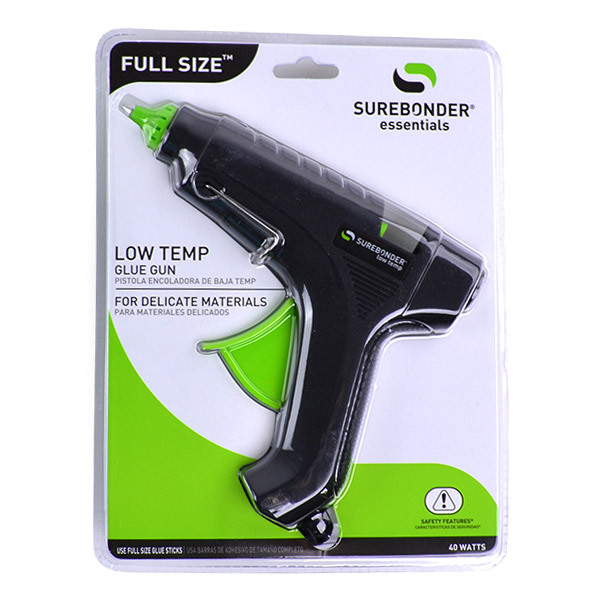 Use your wax heat gun to squeeze a small circle of wax where you want your seal to be, around the same size as your stamp’s design. 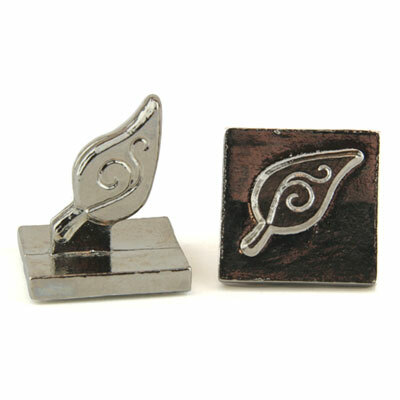 Make sure your stamp design is facing the right direction, gently press it into the dollop of sealing wax, leave it in place til the wax hardens, and gently lift to reveal your design. 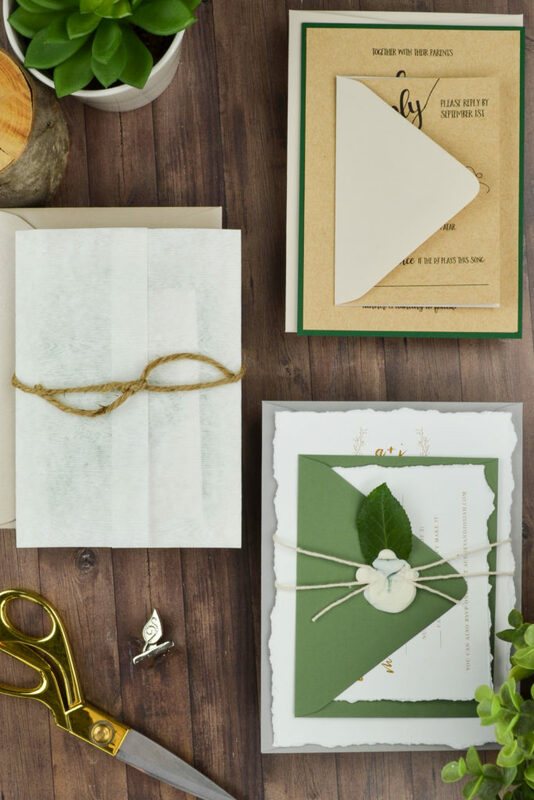 You can then carefully peel your wax seal off your wax paper and put the wax paper to the side to use for your next invite. 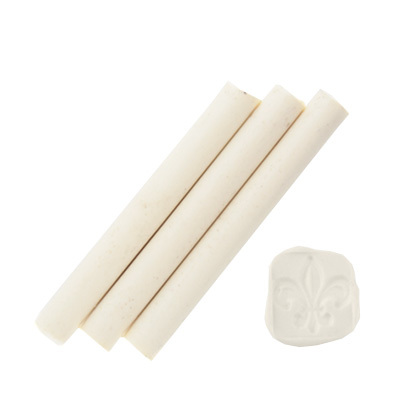 White Wax and Leaf with Swirl Seal. 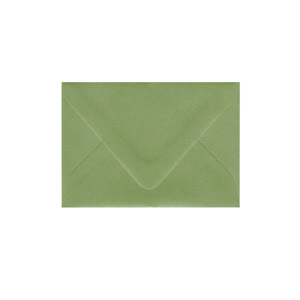 You can choose different color wax to match your wedding colors and choose a wax seal to match your wedding style and personality! 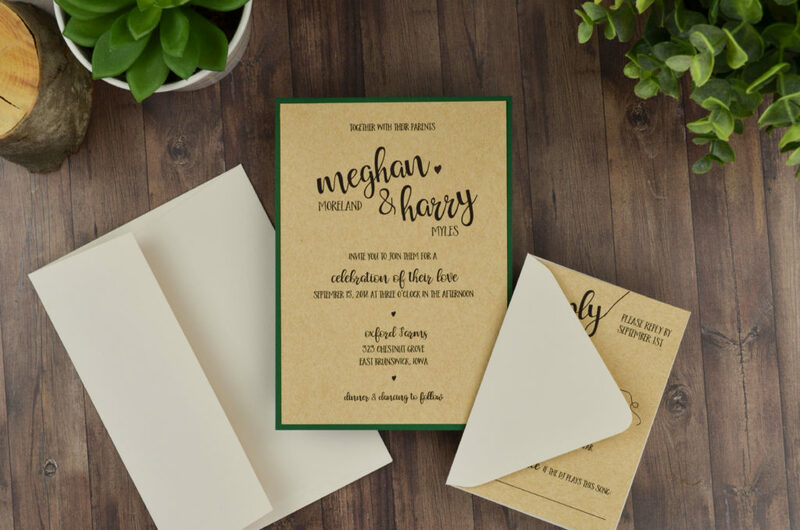 Print your invitation design on textured paper, like our Straw Kraft cardstock, for a unique way to add a special something to a simple invitation design. 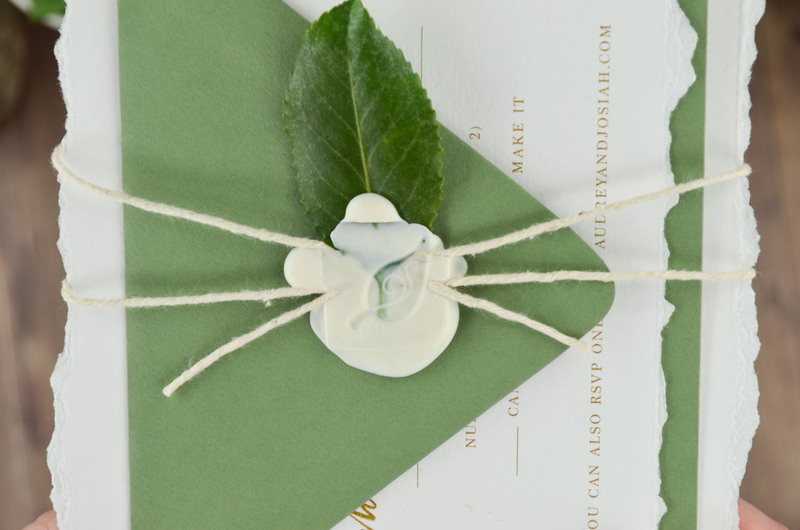 This is a great way to add a subtle nature twist that will enhance your invitations and wow your guests. 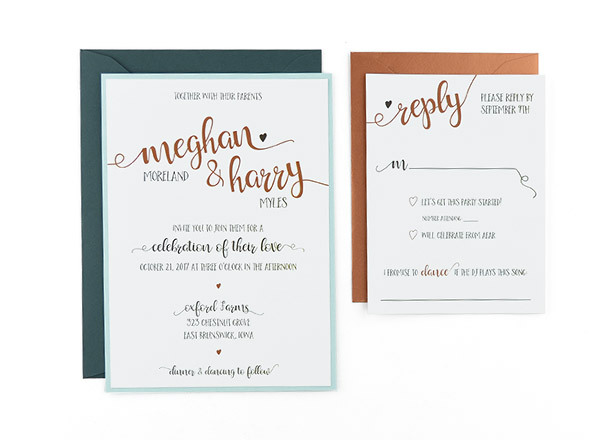 To assemble: Start by choosing your invitation design. 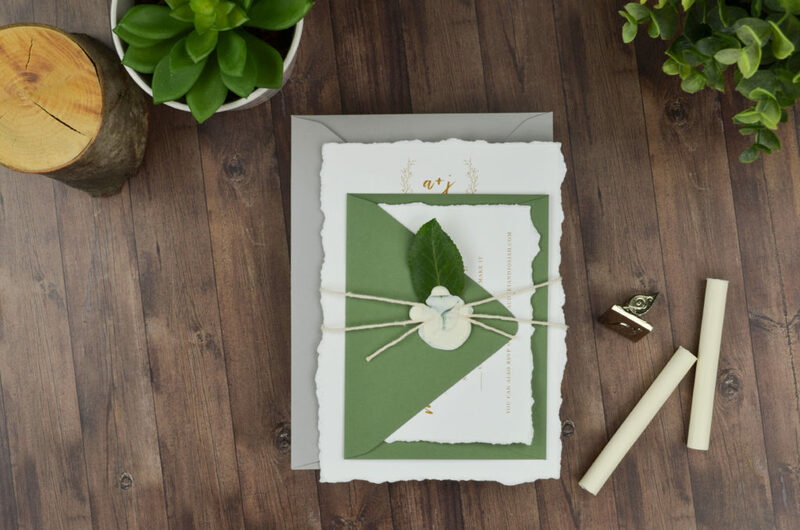 For this suite, we used our “Rustic” design free template, Straw Kraft cardstock for texture, and resized the invitation card to have a final size of 4.75 x 6.75″ and the RSVP card of 3.5 x 5″. 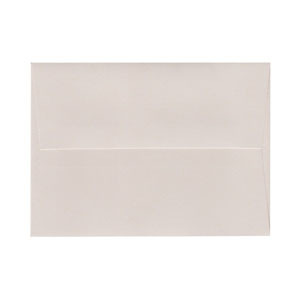 Flip your printed invitation card over and apply tape around the edges, center it over your invitation mat, and securely press it in place. 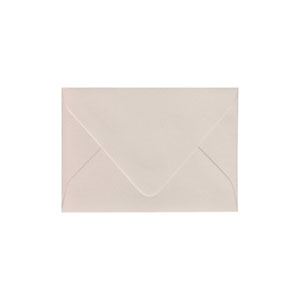 Then pair the invitation and RSVP with neutral tone envelopes, we chose Mist for both. 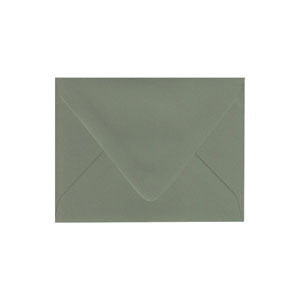 You can always change up the invitation mat and envelope colors to better fit your wedding color palette and theme. 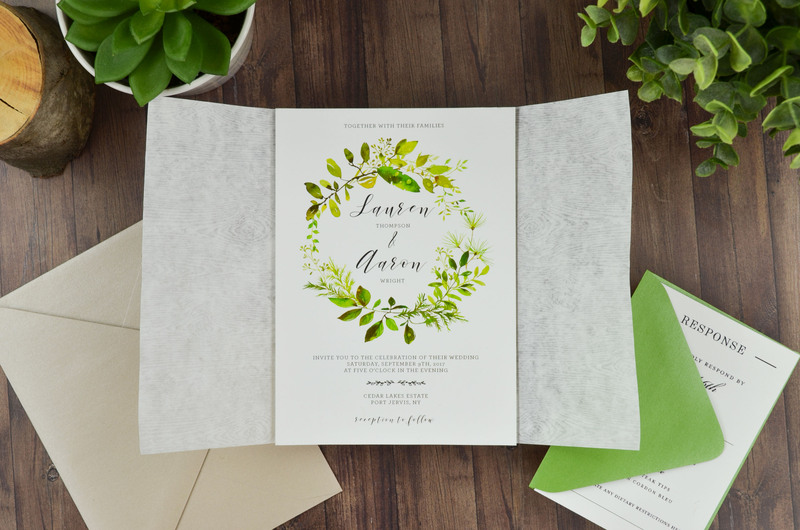 There you have it – three different ways to create nature and greenery invitation suites! Experiment with patterns, textures, layers, and designs – and have fun! 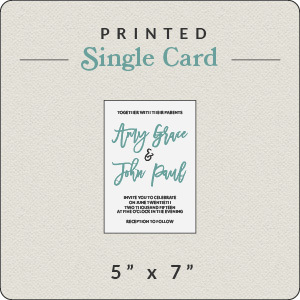 You can print at home yourself or the Cards and Pockets Print Shop would be happy to print your custom designs on our quality cardstock. 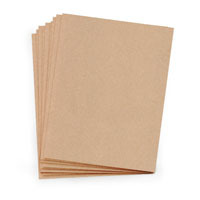 If you would like to print on a color that is not offered in our drop down menu, like Straw Kraft, then contact Customer Service for a quote on price for printing on those colors. See how we DIYed these suites below! 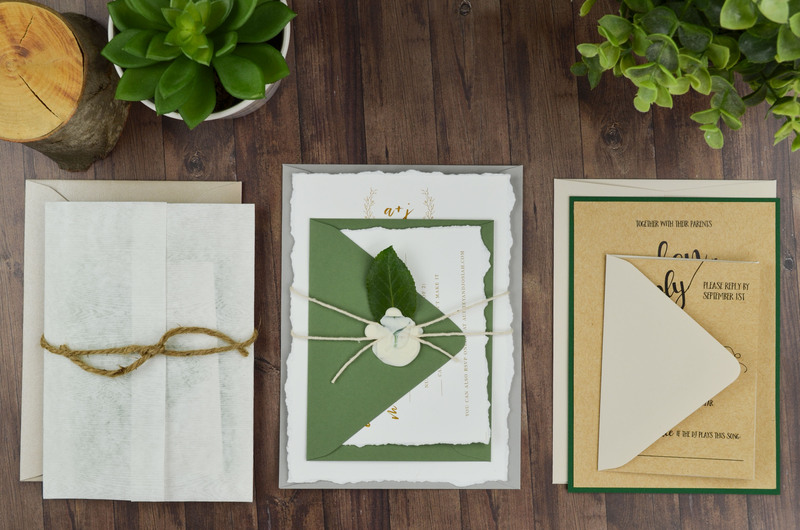 We’d love to see your nature and greenery invitation ideas! Leave them in the comments below or post them on social media and tag @cardsandpockets or use #cardsandpockets.